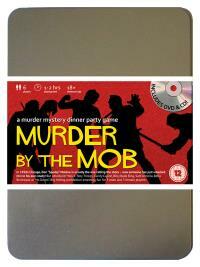 You've been invited to play the role of CANDY CAPISH in Murder by the Mob. Chicago in the late 1920’s is overrun by the mob, most of whom have been invited to "Spudsy" Malone’s party. However, when the Don welcomed everyone to celebrate the invention of his new potato alcohol drink, he wasn’t expecting any of them to "do him a favour" and shoot him in the chest. Join with us to find out who whacked the big potato! "The Bust" – Gangster‘s Moll (what she lacks in modesty she makes up in cleavage!) Costume suggestion : You didn’t get the nickname ‘The Bust’ for nothing and your low-cut tops and pearly necklaces are designed to show off your assets to best effect. Aside from your heaving cleavage, you tend to wear pinstripe jackets and skirts to show you affiliation to Tony. Use this information to introduce yourself to your fellow guests. You’re Tony’s wife. Being a gangster’s moll is a lot more work than people think. You always have to look pretty, which fortunately comes easy to you. But you also have to know a hundred different ways to get blood out of his suits and that’s quite a skill! When you’re not cleaning up your husband’s handiwork, you like to visit the salon with the girls or go shopping for a new dress.